An article written in 2008 about a lockout of supermarket workers in New Zealand in 2006, looking at the role workers themselves played in the lockout, including some background to then state of class struggle in NZ. In this article I will discuss the unfolding of the dispute focussing on the workers’ own activities and the extensive solidarity effort. I will go on to talk about the ways this dispute led to workers disregarding legal restrictions on their right to take action, including the wildcat occupation of the Feltex carpet plant in Riccarton in Christchurch. Finally, I will discuss the way Air New Zealand threatened the outsourcing of passenger and baggage handling services during the term of a collective agreement, in order to gain concessions from their workers, as a glaring example of the inability of workers to fight back without consciously and purposefully challenging the law. Only through direct action can workers challenge the law and force a change, first in the attitudes of the union bureaucracy and then in government. An extension of the right to strike could then open up possibilities and deepen the class struggle. Firstly though, I will give some background to the current state of industrial relations in Aotearoa-New Zealand and some context for this particular dispute. In 2000 the newly elected Labour-Alliance government replaced the previous National government’s notorious Employment Contracts Act (ECA) 1991 with the Employment Relations Act (ERA). The new legislation restored legal recognition of unions as the principle representatives of workers, restored union access to workplaces, and sought to promote collective bargaining in ‘good faith’. The object of the new act acknowledged and sought to address the “inherent inequality of power in employment relationships.” However, the new statute kept on the books harsh restrictions on the right to strike. Legal strike action is restricted to the period of negotiation for a new collective agreement, and only after 40 days have elapsed since the notification of an ‘intention to bargain’. Health and safety is the only other legitimate reason for industrial action. Strike action during the term of an agreement, secondary strikes and boycotts, and any industrial action for social and political reasons, is illegal and punishable by large fines and jail terms for those that do not comply. Thus, although not as extreme as the ECA in its complete repudiation of unions (the ECA referred instead to employee organizations), the ERA restricts severely the power of workers to successfully challenge the power of capital. The current legislative environment has enabled a small resurgence in the union movement to emerge. Figures from the Victoria University Industrial Relations Centre’s ‘Unions and Union Membership in New Zealand: Annual Review for 2004’ show a steady increase in union membership since the introduction of the ERA. Union membership has increased in absolute terms by 17% to 354058 members in Dec 2004 since the low in Dec 1999 of 302405. However, union density (membership as a proportion of wage and salary earners) has remained static at 21.1% due to an overall growth in the labour force.2 Since 2005, with the emergence of the EPMU’s 5% in 2005 ‘Fair Share’ campaign, unions have begun to address the chronic low wage situation in New Zealand. The Employment Contracts Act 1991 successfully achieved its aims of decimating union organization, driving down real wages to facilitate a new regime of capital accumulation. The value of the New Zealand wage now stands 35% below that of Australia, and real wages have fallen by 6.5% over the period from 1980 to 2001.3 By contrast, profits increased by 44% in the period 2001 to 2004. 4 2005 saw the number of stoppages rise as workers took action in support of above-inflation pay increases. This is likely to continue as discontent over low wages has substantially increased, with the EPMU renewing its campaign this year with the same demands. Industrial action in the health service in defence of previous wage gains was also very widespread last year and is continuing with both radiographers and lab technicians striking again recently. However, strike action is still at very low levels historically. The last 2 years have also seen campaigns like Unite’s ‘Supersizemypay’, organising the fast-food corporations, campaigns to increase the minimum wage and to abolish youth rates. Although limited in their politics (see ‘Supersizemypay’), these campaigns represent a better alternative to the quietism and partnership rhetoric of the union mainstream. Overall then, the Progressive dispute took place at a time of rising workers’ expectations and a more confident union bureaucracy. In 2002, New Zealand’s supermarket industry became a duopoly when Progressive Enterprises Limited bought out the Woolworths chain for $690 million. PEL, who own the Woolworths, Countdown and Foodtown brands, control 44% of the market, competing with Foodstuffs (Pak’n’Save, 4 Square, New World), who control the remaining 56%. PEL immediately implemented plans to rationalise their supply chain reducing their five DCs to three. Progressive decommissioned DCs in Wiri in Auckland and Hornby in Christchurch, merging their operations into two single massive DCs in Mangere (Auckland) and another Hornby site. The Mangere DC was opened on 8th August 2003, at a cost of $28 million. At 60000 m2, the size of 10 rugby fields, the Mangere DC operates 3 shifts of 100 staff, and distributes 70% of the goods for 153 supermarkets in the upper North Island. The Hornby DC supplies goods to all PEL South Island supermarkets and the Palmerston North DC to all PEL supermarkets in the lower North Island. The major consequence of this rationalisation for workers was the breaking up of the old Woolworths collective agreement. Redundant workers were rehired on worse conditions. Only those workers in Palmerston North managed to escape this fate, as PEL could not find another site to relocate their DC and could not fire and rehire the workers. The result of PEL’s manoeuvring was 3 separate collective agreements at each site with Palmerston North retaining their superior rates and conditions, followed by Auckland, and then Christchurch on the lowest. Christchurch workers earned $1.80 to $2.00 per hour less than their Palmerston North counterparts and Auckland workers, 80c to $1.00 per hour less. PEL then locked out its distribution workers on Monday 28th August. Clearly imagining they had the upper hand PEL embarked on a PR campaign to discredit the workers’ claims, including full-page ads in the major daily newspapers. These ads falsely claimed that the union was demanding an effective 30% pay rise. The ads were also displayed inside the stores in the first days of the lockout. The company’s claims were patently false and this tactic backfired on the company badly as public sympathy fell clearly on the workers’ side. (PEL later admitted the claims amounted to 13.5% not 30%.) Thus began a war of attrition in which PEL attempted to starve the workers back to work without an agreement. Continuous round-the-clock picketing was solid at all three DC sites and extended to flying pickets outside supermarkets and logistics firms as PEL attempted to circumvent their normal distribution operations. PEL used temp workers to unload goods delivered from suppliers directly to its supermarkets. This led to one of the first confrontations of the dispute with the threatened trespassing of 30 workers picketing the Auckland Airport Foodtown in response. Later non-union temp workers at Three Kings quit the job after talking with the locked-out workers. PEL also used the logistics firm Linfox to illegally perform work normally done by the locked-out workers leading to an injunction being taken out by the union. Various protest pickets were undertaken outside supermarkets with no attempt to stop trucks entering the premises. At Countdown Lower Hutt union officials specifically asked the supporters who turned up not to try to stop trucks. Rather than accepting material support for the struggle, some union officials actively stifled it in an effort to retain union control.6 Later 3 supporters at Countdown Lower Hutt were arrested as they actively blockaded trucks from entering the loading zone in the car park, which was being used as a makeshift distribution centre. The police threatened to use pepper spray on the picketers. The largest arrests were made on 8th September when 10 people were arrested in Auckland while attempting to stop a truck. The truck driver drove dangerously through the picket line while swinging a metal pole around from his window. Workers engaged in some picket line sabotage, throwing tacks and nails in the path of trucks and forklifts. Wharfies in Australia and New Zealand unofficially slowed down PEL’s cargo. The NZ Council of Trade Unions had officially resolved to, “Consider and provide all possible action, industrial and other, to support the resolution of this dispute by a just settlement.”8 The Maritime Union of New Zealand threatened to stop unloading PEL’s cargo at the docks but in the end this did not eventuate. It is possible that if the dispute had dragged out longer this may have become a real possibility. The Australian wharfies union may also have taken official action of this kind. Tactics inside PEL’s stores included groups of supporters engaging in ‘trolley-jamming’, filling trolleys to the brim and leaving them in the aisles or at the checkouts. Many shoppers observed an unofficial boycott of PEL stores. A very impressive national solidarity effort was made to support the locked-out workers. This included a range of fundraising activities including the setting up of a donation phone line appeal by the NDU whereby people could call up and automatically donate $20. 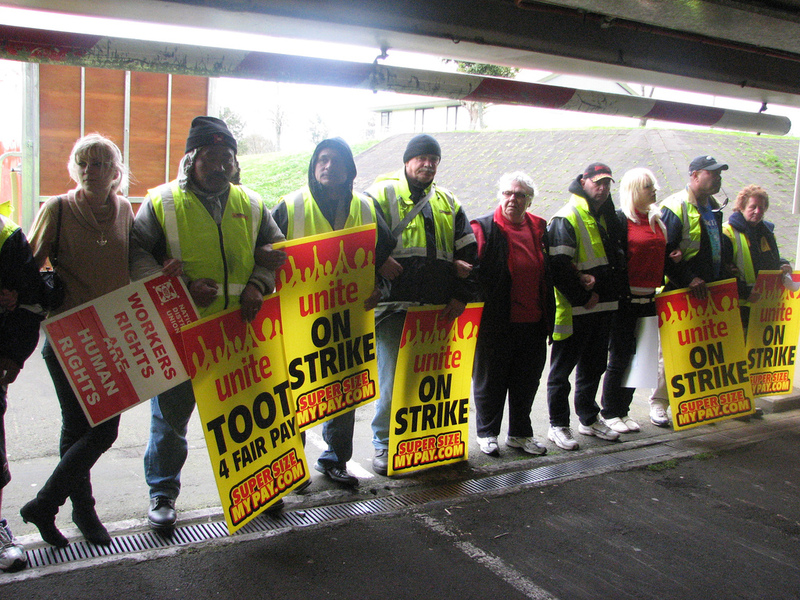 Street/worksite collections and donations from other unions, including 3 Australian transport unions who also sent a solidarity delegation to the Mangere picket line, were part of an effort which had raised over $400 000 by the end of September. Working class communities banded round and took part in several support rallies in each centre. A supporters group was set up in Christchurch and the Palmerston North Association of University Staff branch organised an adopt-a-family scheme. In Auckland graffiti artists ‘Disruptive’ spray-painted and donated a mural in solidarity. Early in the dispute PEL tried to bypass the union by sending letters to each union member containing a derisory offer that did not address the issue of pay parity. The offer was unanimously rejected by all the union members. Workers in Palmerston North burnt their letters while those in Auckland sent them back en masse to the company in a giant envelope. A settlement was finally negotiated on 21st September in a late night meeting between PEL management and the union’s top brass, the delegated negotiating team having been asked to leave the negotiations. Union members were kept in the dark about the terms of the settlement until they attended ratification meetings the next day. The settlement maintained three separate collective agreements at each site but as the union was effectively bargaining nationally anyway this is not really important. The deal delivered parity across all three sites at a level equal to 95.4% of existing Palmerston North allowances. The lowest paid workers in Christchurch would see their pay rates increase by 19.7% after 2 years. The settlement was voted on in ratification meetings on 22nd September. Unsurprisingly a majority of workers in Palmerston North and Auckland accepted the deal whereas the Christchurch workers, who had the most to gain from a settlement, nearly rejected it, voting by only 51% to return to work. NDU delegate Carl Skivington said the workers in Christchurch were still very angry and reluctant to go back to work. Accordingly they voted at the ratification meeting not to return to work the next day! As it happens this also occurred in Auckland and Palmerston North. Workers at all three sites gave PEL the fingers by marching back to work en masse at 8 a.m. and promptly turning around and marching back out again! Auckland DC workers went on to protest outside the ANZ bank who put carpet company Feltex into receivership while Christchurch workers went to support Feltex production workers at Feltex’s plant in Riccarton. The lockout clearly produced a large group of militant unionists, exemplified in their defiant gesture of not returning to work immediately upon ratifying the new agreement. The experience of the lockout radicalised many of the workers producing a new sense of solidarity at their worksites and with other workers. Simply being away from the daily grind of work is enough to impart a new perspective on society and this was evident to me when I talked with the Christchurch workers who came down to Dunedin. These people were having lots of fun, despite the hardships of having to survive without pay. A large number of workers in Christchurch were very unhappy that they would not get their demands for pay parity immediately and gave union officials a very hard time at their ratification meeting. The officials were obviously scared that the vote would be close and therefore chose to lower the ratification criteria to 50%+. Following the lockout at PEL, day-shift workers at Feltex’s carpet manufacturing plant in Riccarton took part in an illegal strike when they stopped work at noon and occupied their cafeteria until 8.30 that night. The workers were being made redundant and were protesting reductions in their redundancy payments. Obviously they felt they had little to lose by engaging in an illegal action. Although defensive in nature it points concretely towards the necessity of taking action outside the framework of bourgeois legality and the only possible solution to continual layoffs and declining wages – the abolition of capitalist social relations through direct workers’ control of production. Workers at the national airline Air New Zealand have recently been subject to attacks on their pay and conditions and been unable to take legal industrial action to defend themselves. Air New Zealand threatened to outsource its passenger and baggage handling services to Spanish-based international contractor Swissport unless concessions were granted by its workforce. This has led to a split between the two major unions representing ground staff at the airline. The EPMU has cut a deal which staves off outsourcing for two years at the cost of cutting take home pay for each worker by an average of $7000 per year. So far the Service and Food Workers Union (SFWU), the other major union involved, has refused to negotiate with Air New Zealand until the collective agreement covering its members has expired. Air New Zealand has been illegally pressuring SFWU members to leave their union and join the EPMU. A determined and self-organised strike across the whole airline was not outside the bounds of possibility and could have changed Air NZ management’s minds about outsourcing very quickly indeed. Wildcat strikes by airline staff in Europe recently, have shown the way in terms of the amount of disruption that can be achieved to business as usual. If workers at Air New Zealand saw a way to organise themselves across union lines in defence of their common class interests then they would have a fighting chance of resisting the further assaults on the horizon. Only by moving outside official union control, and openly defying the law, will workers make long-term gains. 1. “Many say that the class war is over. We know it is not. The Cold War is over but the fall of the Berlin Wall gave Capitalism a new arrogance. The struggle for a fair share and for social justice remains …” Ross Wilson – Speech: ‘Working with Politicians’, delivered to NDU conference, 16November 2006. ‘Fair Share’ is the name of the EPMU’s campaign to achieve minimum pay increases of 5% in the 2005 bargaining round onwards. 3. Figures quoted in the Workers Charter, June 2006, p.3, and CTU pamphlet, Make Poverty Wages History, 2006, respectively. 5. PEL’s meat processors were paid considerably under the average for the industry and were striking in support of a claim for a 12% pay rise as a first step towards achieving pay parity with comparable plants. 6. See Torrance’s comments after report on Aotearoa Indymedia, 5/9/2006.